Courtesy of Renee Witterstaetter and Eva Ink. 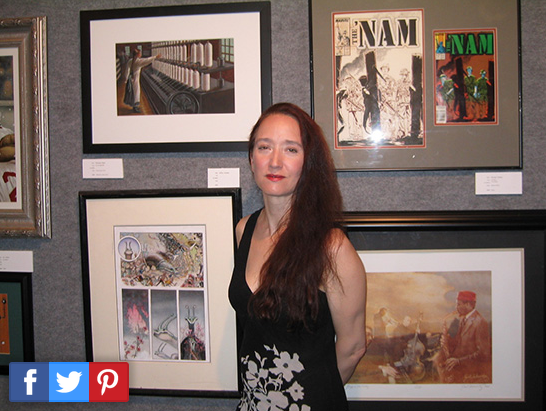 Renee Witterstaetter Discusses "The Business of Comics"
At the WizardWorld Comic Con in Raleigh, NC, Renee Witterstaetter took the time to go on the record with Legendarium Media. 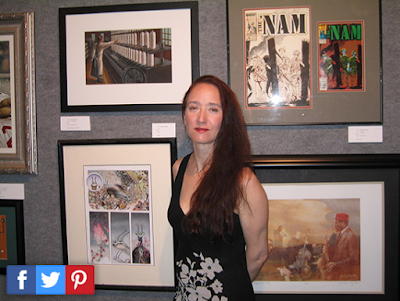 Witterstaetter worked as an artist, writer, and editor with DC, Marvel, and Topps Comics and now runs her own publishing company, Eva Ink. Legendarium: What interested you in the comic book industry? Renee Witterstaetter: Oh, well, gosh, I’ve always been interested in storytelling ever since I was a young kid. Storytelling was always something that always attracted me, whether it was movies, or books, and comic books as well. My first exposure to comic books: I had two older brothers and I would often go into their room to look for reading material, and I think some of the first comics I ever saw were the issue of Spider-Man where he met Mary Jane, and also some kind of really funny DC comics that featured Jerry Lewis, and I just loved the storytelling, and it just so happened that my career ended up being in journalism and English and certain doors opened to me and that led to me becoming a comic book editor. L. Through that experience growing up, did you have any particular favorite characters? R.W. I always did like Spider-Man. He was always one of my favorites and I gravitated more towards the Marvel books because to me at the time they did seem to have a lot of empathy, you could really relate to them, they had flaws, they had very accessible personalities. There were some DC characters I liked as well like Batman, but I have to say that one of my favorites was always Spider-Man. L. You worked on some licensed works as well, such as The X-Files and The Shadow. Did working with licensed works introduce you to any new fandoms that you became attached to? R.W. Oh, absolutely! I really enjoyed working on the licensed projects! In fact, when I first read the “Jurassic Park” novel I took it to my bosses and said, “You know, we really need to try to get this license and make it into a comic book.” And we did! 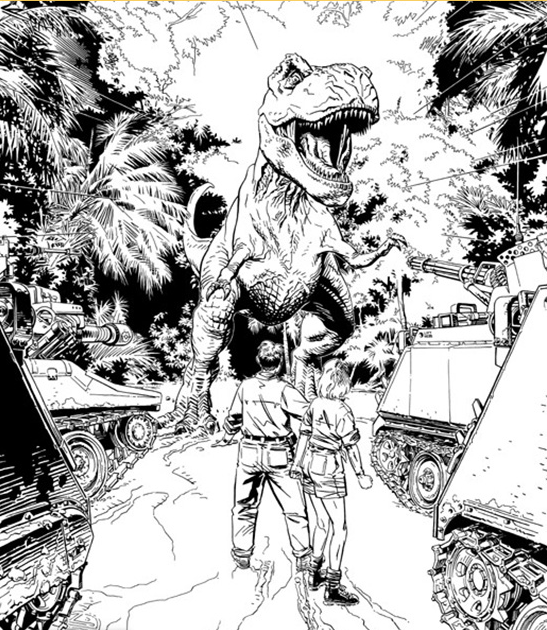 That was at Marvel at the time. . .The person I took it to at Marvel [was] like, “Well, we don’t really need to do Jurassic Park because we’ve got Devil Dinosaur.” But then I shortly after that started working at Topps Comics and they actively pursued the Jurassic Park license and I got to work on it anyway, and I love dinosaurs so that was a dream come true. I had Michael Golden doing all my covers, one of the best artists in the industry, and I had some wonderful writers on that. And I really enjoyed X-Files as well, because it was a TV show that I really enjoyed. And one of my favorites was also working on the [comics for the] Hercules and Xena TV shows. We would receive tons of Email from people on all of those properties that just really enjoyed those particular genres, and it led me to being able to go visit the TV sets of a lot of those shows, and it was a lot of fun. You know, there wasn’t the infrastructure of conventions when those books came out like there is now, so honestly, I’m just now beginning to meet a lot of the fans that were reading my books when those shows and properties were being done. Jurassic Park Comic. Courtesy of Renee Witterstaetter. L. So when did you start coming to the con scene? R.W. I’ve been an artist agent now since 2003. So, I’ve been taking whatever artists I’m working with and representing them on the con scene since 2003. I’m also a publisher, I have Eva Ink Artist Group and Eva Ink Publishing, so I’ve been taking my own books and books that I print on and publish on other artists to shows and also selling them through Diamond [Comic Distributors], so that’s been really great on the convention scene to introduce the artists to fans that haven’t met them yet, and also to introduce our books to a wider audience as well. L. Speaking of Eva Ink, what are some of your upcoming projects? R.W. We always have a lot of projects in the works. I’m currently working on a trade paperback of Spartan X, which is a series that I created with Michael Golden. My new book. . .“Nick Cardy: The Artist at War” and all of his sketches from World War II, those have just been released by Titan Books in England, so that’s a brand new book. We’re also planning some new sketchbooks on various artists like Michael Golden, and then I have a few very specific and very fun books which I’m writing right now but I can’t really talk about those yet. 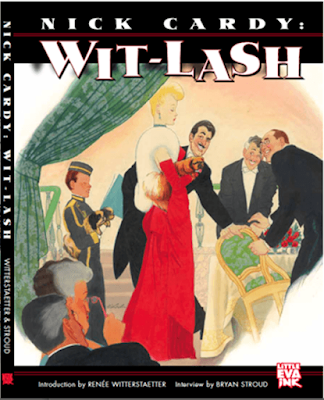 “Nick Cardy: Wit-Lash,” an artbook featuring Nick Cardy’s humor art. Image courtesy of Renee Witterstaetter and Eva Ink. L. How did you get into editing comics, and how is that different from editing print work, like novels? R.W. Well, my degree, like I mentioned, was in journalism and English, and through that door I was hired. My first job out of college was doing public relations for a show that put on comic book conventions. That was in Texas, it was a company called the Dallas Fantasy Fair and they’re not around anymore, but they were really the forerunners, I would say, of the modern-style convention. From there I was hired by DC Comics as an assistant editor, and from there I went to Marvel and Topps, and from there I started my own company. But, really, editing a comic story is not that much different from editing a newspaper story or editing a novel because you are still looking for the same elements. You’re looking for a good story. You are looking for what we call in journalism the essentials. You have to read something and say, “Does it answer Who, What, Why, Where, How, and When?” If you have all those elements answered in your story, then when your reader is reading that—whether it’s a comic or a novel or a newspaper story—in their brain they’re gonna feel like they have all the information. Even if they don’t stop to pick out all those elements while they’re reading it, their brain knows if it’s there or not. So, as an editor, you’ve got to make sure that all the essentials are there so it’s a fulfilling package. And the difference with being a comic book editor is that. . .if you’re doing it the way American publishing works—where you have the writer, the artist, the inker, the colorist, the letterer—you’re dealing with five creative people on every book you work on, so your job as the editor is to find the best people for that job, the person whose writing and art style fits that project, and then finding that group of people that works well together and also makes the deadlines, because in American comic books, that’s a very important element as well. So, as the editor, you are the director. You are the producer and the director of putting this project together. Renee Witterstaetter showcases some of her work. Courtesy of Renee Witterstaetter and Eva Ink. L. As both an artist and having a background in journalism, did that give you valuable insight into the creative process of comic book making? R.W. I would like to think so, and I had a very good relationship and still do with all the artists that I work with, and they have always been very accepting of any feedback I give them, any changes I ask them to, because I always approach it from a storytelling perspective and I explain why I’m asking for the changes. And if you do that, they’re like, “Yeah, I see what you’re talking about.” So I do think having that background has helped as an editor. L. In closing, do you have any advice for any aspiring editors or comic book artists? R.W. You know, it’s a wide-open market right now. There’s so many different avenues you can find to get your work out there, including the Internet. If you have your own project that you want to get out there, self-publishing [and] doing webcomics is a great way to go. I would say if you’re doing your own properties to get your intellectual properties in print either on the web or on hardcopies, to protect your copyrights, and if you’re not doing all of the elements of the story yourself, find good people that you like to work with and even if they’re your brother, sign contracts. [Laugh.] And protect whatever it is that you’re creating together. You know, you may go into this thinking like, “Oh, he’s my best friend and we’ve known each other for 20 years!” That may be true, but in business, you also always have to. . .you know, it just helps preserve the friendship, I would say, and just realize that this is a creative medium and to try to find things that you like to work on. You know, if you’re the artist, find the style that you wanna work on, and find out if you wanna work with Marvel or DC, find out what it is that they’re working for [and] looking for. I can tell you that they want you to do at least eight pages of things that are focused on their property. So you wanna do their characters. But do not give away original story ideas! Find a script online you can go and do those samples from. And there’s so many other things! We should do a panel at it at a show sometime! So you guys come out and see me at one of the Wizard shows, or one of the other shows I’m at, and, who knows? Maybe we should do a panel on this, on the business of comics.